By Scott Gilfoid: #1 WBC, #3 IBF Martin Murray (29-1-1, 12 KOs) earned a title shot against WBA Super World middleweight champion Gennady Golovkin (31-0, 28 KOs) last night with a 7 round technical decision win over #7 WBC Domenico Spada at the Salle des etoiles, in Monte Carlo, Monaco. Murray will be facing Golovkin on February 21st in a fight that will be televised on HBO Championship Boxing in Monte Carlo, Monaco. Murray says he’s not afraid of Golovkin, as he feels he’s got the skills to stand up to him. Murray sees himself as being good enough to beat the other middleweights in the division, and he thinks he’ll be able to pull off an upset on 2/21. So there it is. Murray thinks he’s going to whip Golovkin and take his World Boxing Association strap back to the UK with him. I would more than love to give Murray a chance in this fight, but the problem is I’ve seen his fights against Sergio Martinez, Spada, Max Bursak, and Sergey Khomitsky. Murray just looks like a big fighter with a lot of technical skills, but not much in the way of power. Murray totally one-paced last night against Spada. He was huge, slow, and not powerful. His main assets was his size and his constant clinching. Murray was quite fortunate that Spada looked totally wild and unskilled, because if the guy had some power and technique, he would have given Murray tons of problems in this fight. 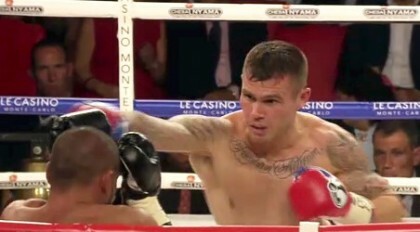 “Arguably, Martin Murray will be the toughest opponent Gennady has ever faced,” said Golovkin’s promoter Tom Loeffler. I don’t know about Murray being the toughest opponent that Golovkin has faced. I mean, he’s been in with the likes of Curtis Stevens and Gabriel Rosado. I rate those guys as better middleweights than Murray. I do see Murray as being the biggest guy that Golovkin has ever faced. It’s now or never for the hulking 32-year-old Murray, who looked like a light heavyweight last night after rehydrating for his fight against Spada. As big as Murray was, he looked to be at least 175 pounds, possibly as much as 180. I don’t know how he does it, because taking off and putting on massive amounts of water weight is extremely difficult for most fighters, but there are always some out there who can get away with it for a period of time before their body eventually can no longer handle the huge shifts of water weight. Murray does a good job of covering up to block shots to his head, and he’s quite good at holding frequently. However, Murray leaves his body wide open for shots, and I see this as something that Golovkin will take full advantage of when he gets Murray in the ring. He’ll focus a lot on going to the body until Murray either drops for the 10 count or he drops his guard and opens up his head for Golovkin to chop it off.